Hi Everybody! Happy Thursday or whichever day it might be in your part of the world. 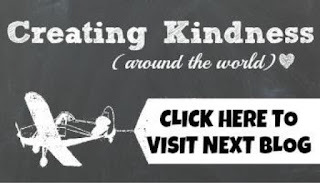 I'm happy to have you stop by today because today is the Creating Kindness Blog and Video Hop day. Myself and some other talented Stampin' Up! demonstrators from around the world have gotten together to share some fun projects and video tutorials as well! Believe it or not, this technique is so easy! 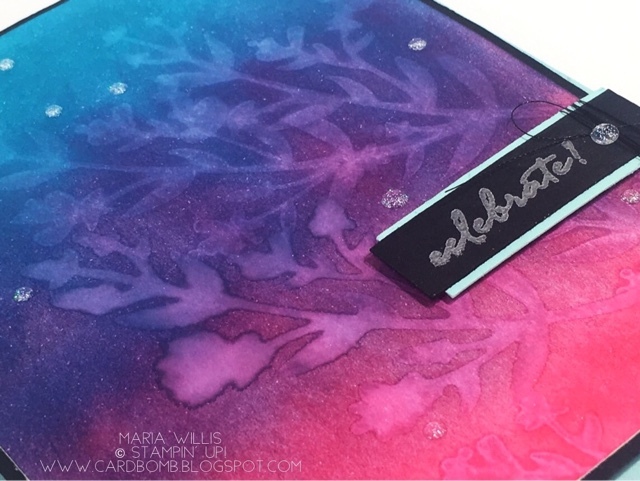 I started with a piece of Shimmery White Cardstock and sponged it with Tempting Turquoise and Melon Mambo (the purple hue in the middle is where I overlapped the two colors). After that I took a stamp from Flirty Flowers and a Stampin' Spritzer filled with rubbing alcohol and spritzed my stamp. I pressed it firmly onto the sponged background, held it there for a couple of seconds to let the paper absorb the alcohol, and lifted the stamp off the paper. The watermark-like effect is visible immediately and is stunning! I dried off my stamp and block with a paper towel and repeated the alcohol stamping multiple times until I had the background I desired. 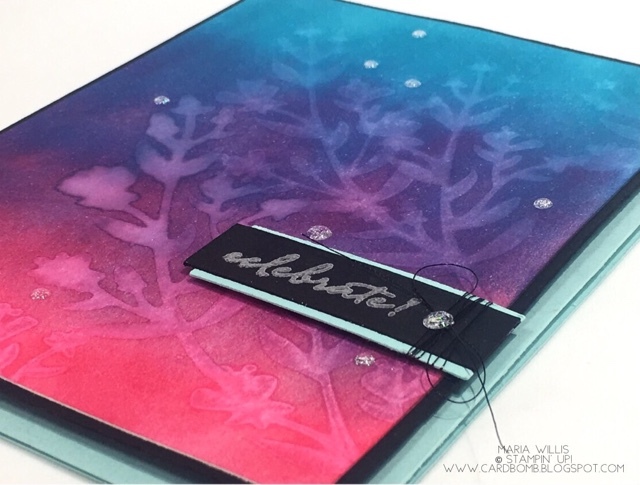 I added a silver embossed "celebrate" sentiment (from Weather Together), some Glitter & Clear Epoxy Shapes (145632) which are new in the Occasions Catalog, and some Black Metallic Thread. I wanted the background to be the star of show so I tried not to over do it. The background is layered on a Basic Black mat and that is popped up on dimensionals on a Pool Party card base. Want to try this technique out for yourself? Here's a quick video tutorial with some tips to help you out. And that's it for today folks. I am sure glad that you've stopped by to visit my blog today and I hope you will continue on the hop by heading down under to my visit my friend Cheryll! Just click her name or the next button below. In case you didn't know Sale-A-Bration has just begun! It's the best time of year to buy all of your favorite things as you get rewarded for every $50 you spend! It's also an amazing time to join my team-so if you've been thinking about it let me know. I'm happy to answer any questions and generally enable you to fill your craft space with fun things. Have an amazing day you guys! Thanks Cheryll! I can't wait to see what you will make w this technique! This card is just gorgeous! I love the colours and how they overlap. The technique is brilliant, Thank you for sharing! 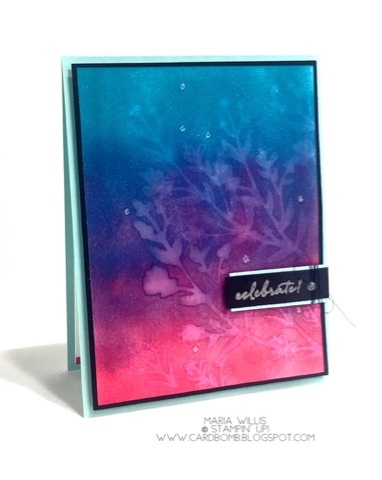 Way to go Maria--this is an awesome stamp technique and your card is GORGEOUS! Thanks Elizabeth! You just made my day! I hope you try it bc I know you'll make something incredible with this technique! You always do something great with color! And this card is no exception. Thank you for sharing this easy, stunning technique! !